I’ve always loved flying. And yes, I know many people look at me and say, “you like being crowded into tiny seats for hours on end with people you don’t know and horrible food and having to pay for every tiny little thing? !” And my answer (most of the time) is yes, I actually do. There is something about getting on an airplane that is just magical to me. First, you’re headed somewhere different which already gives me an amazing feeling. And also – when else in your life do you just get to sit and do nothing but watch movies and tv shows for hours on end? For me, that hardly ever happens, so give me a long-haul with a great movie selection and I’m game, tiny seats be damned. I think though that learning to love flying is also a practiced habit, it’s years and years of experience on planes that allow me to love it now, even in economy which is usually where you’ll find me with a giant scarf and headphones. And while flying is still a tough experience for a lot of people, there are a lot of little tips and tricks that can make it so much better. 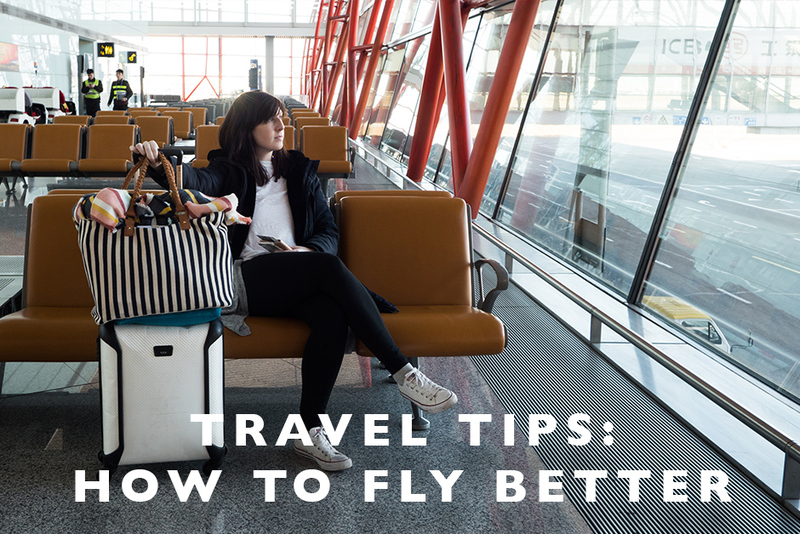 I’ve learned over my years and years of flying that in order to enjoy it, you have to know how to fly better and that includes all the tips I’m sharing with you today in order for you to love flying on your next adventure! Pick your seat in advance, even if you have to pay for it. I’m a huge advocate of picking your seat in advance on airplanes, even for short flights. And even if you’re flying on an airline that makes you pay to pick your seat, do it. A great experience flying, especially on long hauls, is dependent on you being comfortable and your seat has a lot to do with that. Along with this is realizing what type of seat you like to have when flying – some people like the aisle, some the window, some near the bathrooms, some near the front of the plane. Personally, on domestic flights I prefer to be closer to the front and when flying alone, I prefer an aisle seat so I don’t have to climb over a stranger to get to the aisle. On International long hauls, when Nick and I are usually traveling together we try to snag the sections of most airplanes that have just 2 seats instead of 3 by the windows. Most airplanes have this configuration in the back and offer it at a premium price, which for us to not have a 3rd person in our row is totally worth it. Also on long hauls, sitting in the back has its perks being near the restrooms and space to stand up and stretch, you’ll also usually board first in the economy group. Also usually on large planes, they start serving food and beverages from both the front and back, hence you’ll be one of the first ones served when in the air. I recently got to the airport for a short flight and had a little bit of a mini freak out when I realized I had accidentally left my headphones in my school bag instead of my purse. Luckily Nick had an extra pair with him I could use, but truthfully earphones are your best friend when traveling and allowing you to actually love flying. Whether it’s listening to calming music or watching something on your phone or iPad, your earphones will keep you sane and entertained while flying. They are also a great hint to chatty seat mates that you don’t want to spend the whole fighting talking with them. Work your way up to elite status with airlines and always collect your miles. One thing that helps tremendously when you travel is if you have elite status with airlines. I fly a ton every year with Alaska Airlines, particularly multiple trips to Hawaii and back for work, so my miles with them add up quickly and I gain their MVP Gold status every year. With that elite status, it helps with flying tremendously with things like free first class upgrades (which I get often! ), free treats when flying in economy and priority boarding. It’s so worth it to collect the miles offered whenever you fly and try to fly on the same airline or their partners so you can hopefully try to get to elite status. Being an MVP with airlines can help you enjoy flying way more than without it and makes the whole experience better from start to finish! Bring entertainment with you – don’t rely on the airline. I’m always shocked when I get on the plane and people around me didn’t bring any entertainment and relied on the airlines. I can’t tell you how many times I’ve gotten on a plane that’s supposed to have amazing in-seat TV’s and find out the plane got switched and there aren’t any or they don’t work right or the collection of TV shows and movies is pretty dismal. I always load up my iPhone Plus with lots of movies and TV shows to last me the whole trip. I’m a fan of binge watching TV shows when flying and I’ll save some of the shows that I know Nick won’t want to watch for long haul trips. Lately, my go-to has been working my way through all the seasons available of Vikings. And you don’t need an iPad or a tablet either, your phone is just fine! For a cheap and easy way to stand your phone up on the airplane, check out this post! Always travel with battery chargers. My mom gave me a cute little Kate Spade battery pack for my phone a few years ago and I never travel without it. There are so many times while flying and traveling in general that you can’t find a phone charger or you’re on a plane without power outlets (oh the horror!) and having a quick small battery charger is a lifesaver. Sign up for Global Entry – now! I’ll never stop singing the praises of the Global Entry system if you’re a US citizen. Basically you are pre-screened by the government and deemed a n0-risk traveler so that you get access to the TSA Precheck system, which allows you to fly through airport security without having to remove everything you own. We usually fly through our Precheck security line in under 5 minutes, seriously. And perhaps even better, if you travel internationally a lot, when coming back through Immigration and Customs, you go straight to a kiosk instead of waiting in those long lines and saving a ton of time coming back into the country. We’re able to make connections after an International flight that you never would make waiting in normal Immigration lines that sometimes take hours to get through. Seriously, it’s a life saver when traveling and will make your time at the airport easier, hence your actual flight more enjoyable! Bring your favorite type of airplane pillow with you always. I’m pretty sure you can divide people into groups of personality types based on what type of airplane pillow they like. Nick likes the wrap around the neck kind and he prefers one that he can blow up on the plane so it’s not one more thing to lug around. Myself? I prefer a standard little rectangular pillow that I can mold how I want to. Whatever type you like, buy one and never leave home without it. I also use mine as an armrest a lot when I’m not sleeping to soften the airplane armrests so your elbow has something soft to lean on throughout the flight. Never travel without a scarf, or many scarves. If you’d ask Nick what my biggest weakness is in life, he’d probably say my obsessions with scarves. I love scarves and I wear them year round. But what a scarf really is perfect for, is flying. I never travel without one, even for quick, short trips, you’ll always find a scarf around my neck or in my bag. Scarves can serve so many purposes when flying, from being a blanket when you’re freezing on an airplane to bundled up for added comfort behind your pillow to sitting on them when the airplane seat needs a little more cushion to be comfortable. I usually wear a scarf when flying and have an extra in my carry-on bag below my seat just in case. And when it’s too hot in airports to be wearing a big scarf (like in the image above), tuck it in the top of your carry-on bag and have it ready for when you need it. Bring snacks and bottled water. The food quality is unfortunately dwindling on airplanes these days and unless you know the food you’ll get is going to be good (like Alaska Air’s amazing fruit and cheese plate), bring your own snacks to have throughout the flight. We always buy a few little things at the airport just to have in case we get hungry and the food on board is bad. It’s also super important to stay hydrated throughout a flight so bring your own bottled water with you on board as well. We usually grab a couple bottles of sparkling water and a one large bottle of regular water so we have options while in the air. Ask at the counter about upgrades, you never know! It’s always more comfortable to upgrade your seat when flying, even if that’s just upgrading to a premium economy or more leg room seat. And while sometimes they’ll cost you an arm and a leg and it’s not worth the price, sometimes you’ll be surprised at what you can get when you ask at the counter. Sometimes airlines offer a decent deal right before the flight to fill seats if you want to upgrade, especially is you’re flying on a slow day. It’s worth asking – but always be nice!